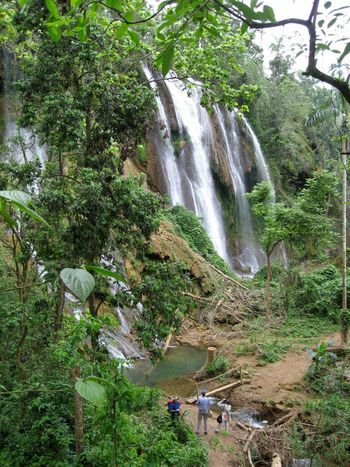 Gran Parque Natural Topes de Collantes is in Cienfuegos, Villa Clara, and Sancti Spiritus provinces of Cuba. 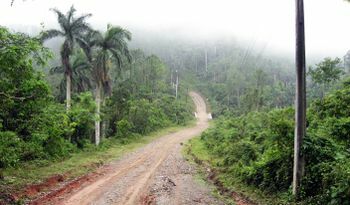 Anti-Batista rebels hid in the Escambray mountains during the revolution. After the revolution (1961-1969) CIA-sponsored anti-Castro rebels (bandidos) hid in the same mountains. The Museo de la Lucha Contra Los Bandidos, a museum in Trinidad, documents the latter fight. The national park has jungle-covered limestone mountains (mogotes) with waterfalls and caves. The highest mountain is Pico de San Juan, at 1150 meters (3773 feet). You can't hike to the summit, as the mountain is in a military zone. From Havana, take the Carretera Nacional (A-1) eastbound until Km 270 (carretera a Manicaragua). The park perimeter starts approximately 50 Kms from the highway. From Trinidad, look for the Topes de Collante turn off from the coastal road (approximately 7 Kms to the West of town) directly following the "punto de control". Be prepared for some treacherous roads during either entry. The main road starts at a junction four kilometers west of Trinidad. The road to Topos de Collantes is about fifteen kilometers and is amazingly steep. It is paved well (by Cuban standards). The road from Cienfuegos through La Sierrita to San Blas is good, and quite scenic. Near San Blas is a cliff with stalactites. Somewhere between San Blas and Buenos Aires, near the village of Matagua, the pavement ends. Locals say the road is impassable after this, unless you have a Jeep. This road goes to Topos de Collantes, and has a turnoff that goes to El Nicho. This road goes through the highest mountains and might be a good mountain bike ride. Be aware that much of the area is military zone, so don't go hiking off the road, or take too many pictures. The national park has several tourist areas. 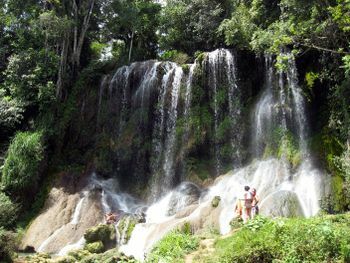 The Salto de Caburní waterfalls. This is the most developed tourist site. The only hotels are here (including the huge Kurhotel Escambray). There's the Museo de Arte Cubano Contemparano ("Museum of Contemporary Cuban Art"); the Casa de Café, featuring locally grown coffees; and the "Mi Retiro" restaurant. The 7-kilometer (roundtrip) hike to the 75-meter Salto de Caburní ("Caburní Falls") is well worth the effort (6.50 CUC fee at the gate). You can swim in the large pool below the falls. The trail starts east of the Kurhotel. Another good hike is the Sendero La Batata, which is about six kilometers (roundtrip) to a cave with an underground creek. You can swim in the cave. Bring sandals for climbing around in the cave, unless the soles of your feet are tough! The trail starts at the Casa de Café. The fee is 3.50 CUC. A Mariposa Lily, Cuba's national flower, along the Sendero La Batata trail. 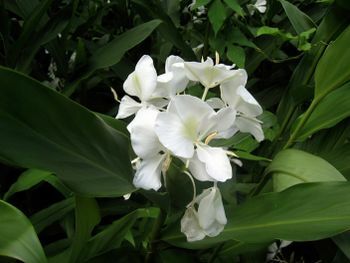 Other features include the Jardin de Gigantes ("Giants Garden") and a short hike to Salto Vega Grande ("Vega Grande Falls'). This is near the Parque Altiplano. A restaurant serves tour groups. There are hiking trails to waterfalls, caves, and viewpoints. Birdwatching and camping are also listed on the map. The Salto de Rocio waterfall. 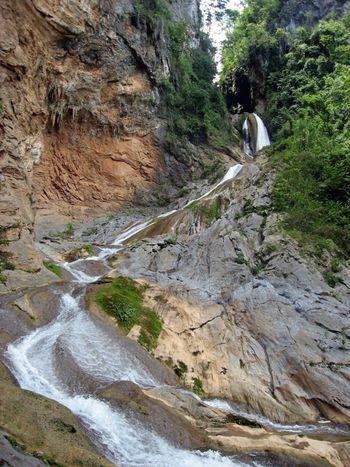 According to the map, this site includes "canyoning cascades," as well as the Cascada El Rocío waterfall, swimming, hiking trails, camping, and a restaurant. El Nicho is a beautiful series of waterfalls and clear blue pools. The drive from Cienfuegos is one to two hours each way. The road is good to Crucecitas, and after that it's OK if you drive slowly. There's a bus from Cienfuegos. El Nicho can be popular, especially in the summer. Don't expect solitude. The entrance fee is 5 CUC. You can hike along the creek above the waterfalls. Horseback riding is also offered. A restaurant serves meals. This site is the closest to Trinidad. According to the map, this site has a waterfall, swimming, camping, birdwatching, horseback riding, and a restaurant. A trail goes to the Mirador de Caribe, which is on the road to Topos de Collantes. This large reservoir is on the north side of the national park. The nearest town is Manicaragua. 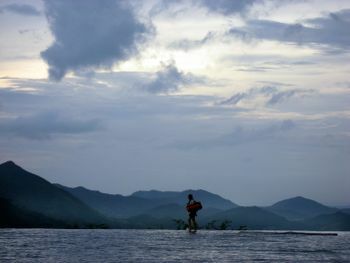 The Hotel Hanabanilla offers hiking, horseback riding, boating, and fishing. The hotel is popular with Cubans; few Europeans or North Americans stay there. In November the reservoir fills and the road to the hotel is underwater. You can either pay the old man with a row boat to row you across, or you can follow a trail to the dam and walk across the dam. The water spilling over the dam is only a few centimeters deep. The trailhead to hike to Atahalaya Hill. An employee at the Hotel Hanabanilla, Cuba, walks to work. Though not in the national park, this resort for Cubans is close by. The resort is on the coast, at the mouth of the Río La Jutía. 51 nice cabins are available, a good restaurant, and a salt-water swimming pool. There's a hiking trail to a nearby cave, and the trail continues through a forest with crabs under every rock. Villa Guajimico is about halfway between Cienfuegos and Trinidad. Closer to Trinidad, Playa Ingles ("English Beach") is a simple campismo for Cubans, with a decent beach but no food or showers. Even closer to Trinidad is Río Yaguuanabo, a more developed resort for Cubans with a large beach below an impressive bridge. The Cueva Martin Infierno is one of Cuba's most important caves. It is closed to the public but speleologists can contact the Sociedad Espeleológica de Cuba in Havana to request a visit. 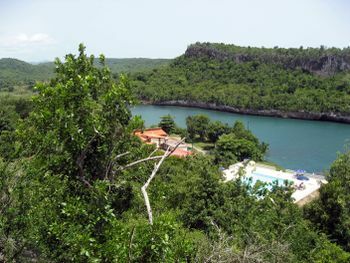 The cave is on the western (Cienfuegos) side of the national park, west of Parque Codina. A second cave, Cueva El Maiz, is nearby. Topes de Collantes has excellent hiking. However, you are required to hire a guide for some hikes. Other hikes you are required to go as part of a group, as part of a group tour, and not just show up asking to join a group. 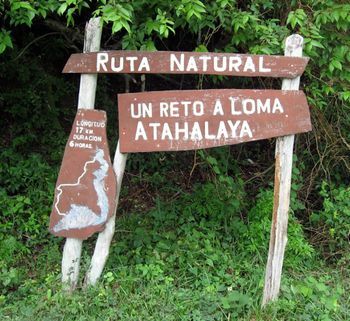 The Cuban government doesn't want tourists wandering around the countryside alone. Also, hiking is not a part of Cuban culture. Cubans like waterfalls and viewponts, but expect to drive to the scenic spot and then sit around drinking beer while their kids play in the water. The idea of walking for enjoyment is incomprehensible to them. Running long distances in the mountains is unimaginable. Don't expect to go hiking the way you would in a Canadian national park. If you want go trail running, bring a pair of running shoes to give to your guide. Boats can be rented at the Hotel Hanabanilla to go fishing on the Embalse Hanabanilla reservoir. The Museo de Arte Cubano Contemparano ("Museum of Contemporary Cuban Art") is near the Kurhotel Escambray. The Casa de Café, south of the Kurhotel Escambray, serves a variety of locally grown coffees. Before the revolution massive construction was going on to build a huge resort complex at Topes de Collantes. The massive Kurhotel was finished in 1954, and has 210 rooms, 16 suites, a spa, a restaurant, five gyms, a cabaret, and a thermal swimming pool, and a television station. After the revolution the Kurhotel was used for tuberculosis patients. It's currently used for other medical patients and isn't open to tourists. Many other hotels were built, and concrete shells of even more hotels can be seen around the area. Hotel Los Helechos ("the ferns") is where the tourists stay, and many tour buses arrive each day. The hotel is rated 3 stars. The hotel has a bar, a restaurant (substandard and overpriced), a small shop, a swimming pool (big, cold, and be thankful that it's cold because it doesn't look like it has much chlorine), and a discotheque. The disco is where the local Cubans hang out, and the music is awful Cuban techno-rap. Bring a CD with dance music you like. Prices are 50 CUC for a double room during high season, 40 CUC for a single during high season, 45 CUC for a double during low season, and 35 CUC for a single during low season. Hotel Los Pinos ("the pines") may also be open to tourists, just down the hill from Los Helechos. The other place to stay is the Villa Caburní. These are twelve nice houses. The price is the same as the hotels, but you get the entire house -- two bedrooms, kitchen, etc. If you have a family and bring your own food this is the best deal. There are no casas particulares. Campismos are indicated on the map, at Parque Guanayara, Parque Altiplano, Parque Codina, Parque El Cubano, and Parque El Nicho. This page was last edited on 26 December 2015, at 15:01.